1.120 degree super wide-angle lens. 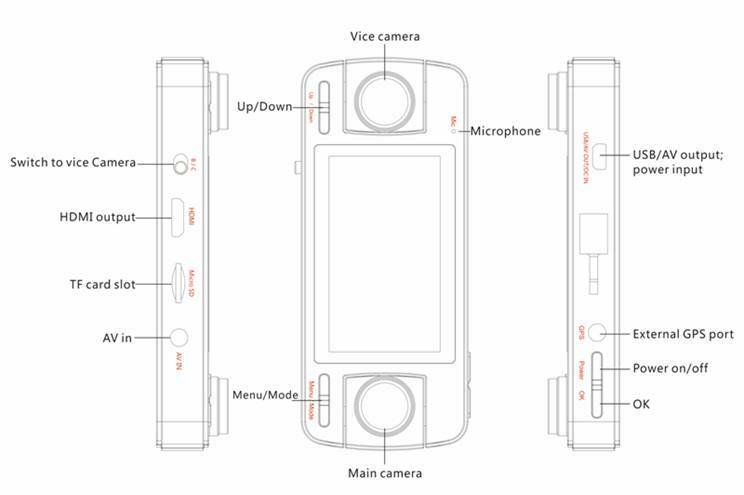 2.With separated dual cameras. Three lenses, one main lens and one vice lens on device, plug an external lens. 3.Press one button to switch the rearview mirror head screen to do the reverse image. 6.2.7 inch high-resolution LCD screen, recording video while watching. 9.30 frames per second smooth image. 11.Continuous recording, will not miss any data. 14.Recording video can be synchronized to watch video and support one key playback. 20.With special auto suction cup holder, to install and easy to use.